This app helps players to choose numbers with an algorithm, UNIQUE IN THE WORLD for Florida Lotto (FL) draws. 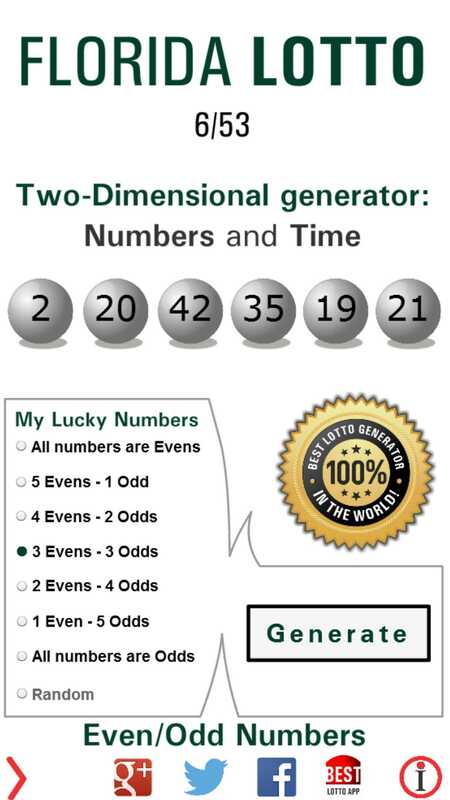 Similarly, sequential numbers having same ending like 2, 12, 22, 32 and so on can never make you hit the Florida Lottery jackpot. In this case, generate other numbers. Match three, four or five of the winning numbers to win other cash prizes. The XTRA multiplier number is selected at random, from 2 through 5, before each drawing. If a FLORIDA LOTTO with XTRA player matches three, four or five winning numbers, he/she wins an amount equal to the original prize amount multiplied by the multiplier that was drawn before the drawing. 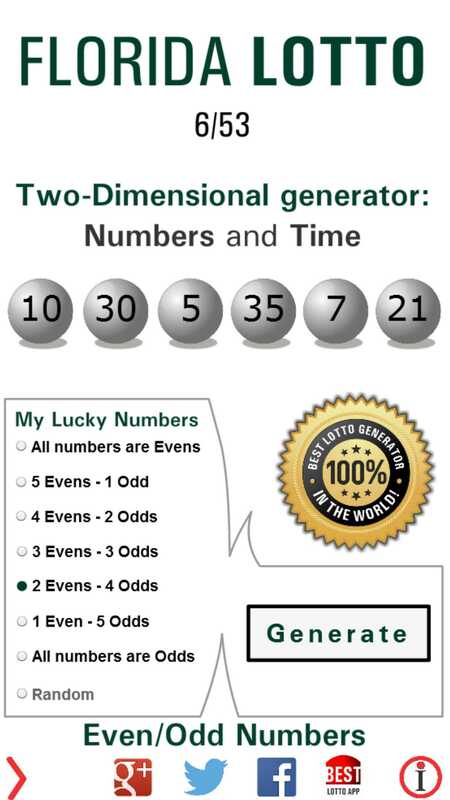 If the player matches just two winning numbers, he/she wins a free FLORIDA LOTTO ticket for the next available draw. To multiply your winnings on non-jackpot cash prizes, select the XTRA box. XTRA costs $1 more per play. FLORIDA LOTTO with XTRA tickets will display “XTRA YES”. Please Note: The XTRA box applies to all panels, Advance Plays and Quick Picks played on the playslip. Give your completed playslip and payment to the retailer. You will receive a ticket printed with your numbers, draw date(s) and the total cost of the ticket. Please check your ticket before you leave the store. You are responsible for the accuracy of your ticket. XTRA is a special feature that allows players to multiply their non-jackpot cash prizes by two, three, four or five times the original prize amount! A player must choose the XTRA option on his/her FLORIDA LOTTO playslip or tell the retailer that he/she wishes to purchase a FLORIDA LOTTO with XTRA ticket. FLORIDA LOTTO with XTRA tickets cost an additional $1 per play. FLORIDA LOTTO with XTRA players who match three of six winning numbers will win a minimum of $25, the 3-of-6 prize multiplied by five, regardless of the multiplier selected for that drawing. Odd numbers are those which end in 1, 3, 5, 7 and 9 while even numbers are those which end in 0, 2, 4, 6 and 8. You are more likely to win if your odd-even number combination is either 2-4, 3-3 or 4-2. More than 60% of the winning combinations in Florida Lottery in the past two years are in these category. Disclaimer: This application has no link in no way with Florida Lottery organism and it does not allow to participate in the official game of Florida Lottery.